One of a number of time-synced metadata (also known as augmented video) formats, Popcorn.js is a scripting library that makes it easy to attach and play back rich media such as pages, links, notes, map references and so forth besides any point of a video or audio file. It turns the way we’ve been thinking of video on the web on its head. Rather than a video player embedded within a page of static text, comments and pictures, these things can be built around the video itself. The timecode of the video is what links everything, rather than the user’s exploration. It envisages a form of web-native filmmaking that ranges from ‘the red button’ and ‘bonus features’ of adding extra information to a completed film, right through to a film that puts interactivity and rich data right at its heart, a kind of living documentary. Popcorn was envisaged and driven forward by documentary filmmaker Brett Gaylor as a way to make the data aspect of his documentaries more dynamic. As audience habits continue to evolve online, with many people watching video while checking Twitter, Facebook or searching the web for more information, a framework that helps the filmmaker not only support that – but narrate it – makes a lot of sense. Popcorn is created and supported by the Mozilla Foundation who make the Firefox browser (amongst many other things) and are one of the stand-out open source success stories: their main product is free and given away – yet make hundreds of millions of dollars from offering a search bar for Google [corrected]. As a non-profit they can put the bulk of that money into moving forward the creative and cultural potential of the web. 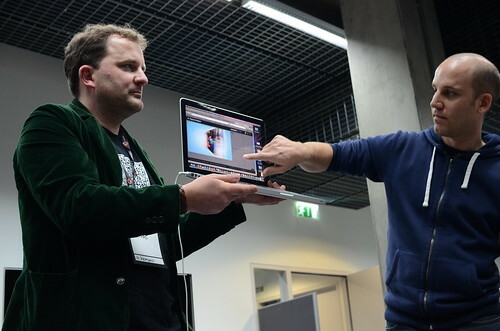 At the previous MozFest in 2011, the delegation from the Scottish Documentary Institute spontaneously assembled a breakout session for documentary makers where Brett explained how and why Popcorn exists and how it could be useful for doc makers (pictured). 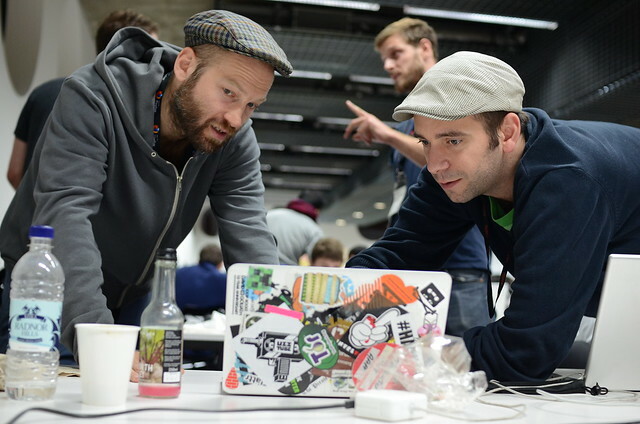 A year later and at Mozfest 2012, Popcorn launched its Version 1.0 - over two years after the first beta version. This means that those wanting to add Popcorn to their video, but who don’t want to go near code, will be able to use a powerful new tool, Popcorn Maker, to add extra information to their videos. This will work regardless of whether the video is hosted on Vimeo, You Tube, or your own server. A TED lecture from Edinburgh 2012 shows Mozilla COO talking thru the creation of a basic Popcorn story, and we hope to publish a how-to guide, later in the year. What does a Popcorn video look like? In-frame – appearing within the video player – either ambient (like title cards or graphics that are part of the film) or explicit (i.e. an overlaid webpage or annotation). This player can then be embedded elsewhere. For example, this TED lecture is contained within a Popcorn player that can then be put on any page. Out-of-frame – outside the video player on the surrounding page – for example the very first Popcorn demo from 2010, which illustrates a range of the possibilities with it. Second-screen – on a second device such as a tablet or smatphone. Popcorn handles all the different kinds of data through plugins – so there are plugins for pulling photos around a certain tag from Flickr or showing a Wikipedia article – and developers keep creating more. Because Popcorn and its plugins are open source, if something doesn’t do quite what you want you’re free to adapt it, for instance making the Google Maps plugin work with Ordinance Survey maps. Read part two on a dozen different demos of Popcorn in action.